نجف زاده اصل, امید, پل, محمد حسین, رضایی گلشن, نبی اله. (1397). بررسی تجربی تاثیر تغییر پارامترهای مختلف بر رفتار لوله‌های کامپوزیتی شیشه/اپوکسی تحت بارگذاری شبه استاتیکی محوری. 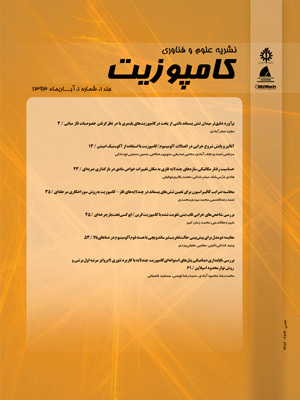 علوم و فناوری کامپوزیت, 5(4), 499-510. امید نجف زاده اصل; محمد حسین پل; نبی اله رضایی گلشن. "بررسی تجربی تاثیر تغییر پارامترهای مختلف بر رفتار لوله‌های کامپوزیتی شیشه/اپوکسی تحت بارگذاری شبه استاتیکی محوری". علوم و فناوری کامپوزیت, 5, 4, 1397, 499-510. نجف زاده اصل, امید, پل, محمد حسین, رضایی گلشن, نبی اله. (1397). 'بررسی تجربی تاثیر تغییر پارامترهای مختلف بر رفتار لوله‌های کامپوزیتی شیشه/اپوکسی تحت بارگذاری شبه استاتیکی محوری', علوم و فناوری کامپوزیت, 5(4), pp. 499-510. نجف زاده اصل, امید, پل, محمد حسین, رضایی گلشن, نبی اله. بررسی تجربی تاثیر تغییر پارامترهای مختلف بر رفتار لوله‌های کامپوزیتی شیشه/اپوکسی تحت بارگذاری شبه استاتیکی محوری. علوم و فناوری کامپوزیت, 1397; 5(4): 499-510. لوله‌های کامپوزیتی در طول استقرار در محل یا کارکرد، ممکن است تحت بارهای ضربه‌ای شبه‌استاتیکی قرار گیرند. با تعیین خواص ضربه‌ای لوله‌های کامپوزیتی و بهره‌گیری از آن‌ها در فرایند طراحی، صحت رفتار این سازه‌ها در شرایط بارگذاری شبه استاتیکی تضمین می‌شود. در پژوهش حاضر، به بررسی تاثیر تغییر پارامترهایی نظیر قطر لوله، چگالی الیاف، زاویه چیدمان الیاف و افزودن فوم بر رفتار لوله‌های کامپوزیتی شیشه/اپوکسی تحت بارگذاری شبه‌استاتیکی محوری پرداخته شده است. نمودار نیرو-جابجایی برای تمام آزمایش‌ها استخراج و با نمودار سایر آزمایش‌ها مقایسه شد. همچنین میزان جذب انرژی ویزه در هر آزمایش برای تمام نمونه‌ها محاسبه شد. نتایج این پژوهش نشان داد تغییر پارامترهای ذکر شده بر میزان جذب انرژی ویژه لوله‌های کامپوزیتی موثرند. به طوری که با افزایش قطر داخلی نمونه و چگالی الیاف به کار رفته برای ساخت نمونه، انرژی جذب شده ویژه نیز افزایش می‌یابد. همچنین نتایج نشان داد که فوم با چگالی 700 Kg⁄m^3 ، تاثیر کمی بر میزان تحمل نیروی وارده داشت که این مسئله باعث کاهش نسبتا کم جذب انرژی ویژه نمونه‌ها شد. ولی با افزایش چگالی فوم تا 1400 Kg⁄m^3 ، هم مقاومت نمونه در مقابل بارگذاری صورت گرفته و هم میزان جذب انرژی ویژه افزایش پیدا کرد. از پژوهش حاضر این مسئله نیز روشن شد که برای نمونه‌های با چگالی الیاف 400 گرم بر مترمربع و زاویه چیدمان [±45] ، مود له‌شدگی به شکل مود تا شدگی با الگوی خاص بود که شبیه تخریب نمونه‌های فلزی گزارش شده توسط سایر محققان می‌باشد. Composite tubes may be subjected to quasi-static loads during placement or operation. By determining the impact properties of composite tubes and using them in the design process, the accuracy of the behavior of these structures in a quasi-static loading condition is guaranteed. In the present study, the effect of changing parameters such as pipe diameter, fiber density, fiber alignment angle and the addition of foam on the behavior of glass/epoxy composite tubes under axial loading has been investigated. The force-displacement diagram was extracted for all experiments and compared with other experiments. Also, the specific energy absorption in each experiment was calculated for all samples. The results of this study showed that the change of parameters mentioned on the energy absorption of composite tubes is effective. As the sample's internal diameter and the density of the fibers used to make the sample increases, the specific absorbed energy also increases. Also, the results showed that with increasing foam density up to1400 Kg⁄m^3 , the sample resistance was increased against the loading and the specific energy absorption was increased. From the present study, it was also clear that for samples with fiber density of 400 g/m2 and angle of alignment [±45], the clustering mode was folding with a special pattern, similar to the destruction of metal samples reported by other researchers. Kakogiannis, D. Chung Kim Yuen, S. Palanivelu, S. Van Hemelrijck, D. Van Paepegem, W. Wastiels, J. Vantomme, J. and Nurick, G. N., “Response of Pultruded Composite Tubes Subjected to Dynamic and Impulsive Axial Loading”, In Composites Part B: Engineering, Volume 55, Pages 537-547, ISSN 8368-1395, 2013. Jiancheng, H. and Xinwei, W., “Numerical and Experimental Investigations on the Axial Crushing Response of Composite Tubes” Composite Structures, Vol. 91, Issue 2, Pages 222-228, ISSN 0263-8223, 2009. Hull, D., “A Unified Approach to Progressive Crushing of Fiber-Reinforced Composite Tubes” Composites Science and Technology, Volume 40, Issue 4, Pages 377-421, ISSN 0266-3538, 1991. Song, H. W. Wan, Z. M. Xie, Z. M. and Du, X. W., “Axial Impact Behavior and Energy Absorption Efficiency of Composite Wrapped Metal Tubes” International Journal of Impact Engineering, 24(4), 385-401, 2000. Karagiozova, M. Alves, N. Jones, “Inertia Effects in Axisymmetrically Deformed Cylindrical Shells under Axial Impact”, International Journal of Impact Engineering, Vol. 24, pp. 1083-1115, 2000. Mirzaei, M. Shakeri, M. Sadighi, M. and Akbarshahi, H., “Experimental and Analytical Assessment of Axial Crushing of Circular Hybrid Tubes Under Quasi-Static Load, Composite Structures”, Volume 94, Issue 6, Pages 1959-1966, ISSN 0263-8223, 2012. Matthew David, Alastair F. and Johnson, “Effect of Strain Rate on the Failure Mechanisms and Energy Absorption in Polymer Composite Elements under Axial Loading” Composite Structures, Volume 122, Pages 430-439, ISSN 0263-8223, 2015. Sadeghi, M. and Pol, M. H., “Investigation of Behaviors of Glass/epoxy Laminate Composites Reinforced with Carbon Nanotubes under Quasi-static Punch Shear Loading” Journal of Sandwich Structures & Materials: 1099636217719223, 2017. Sadeghi, Mohammad, and Mohammad Hossein Pol. "Experimental Studies on the Punch Shear Characterization of Glass/epoxy/CNTs Laminate Nanocomposites." Polymer Composites. Yeganeh, E. M. Liaghat, G. H. and Pol, M. H., “Laminate Composites Behavior under Quasi-static and High Velocity Perforation” STEEL AND COMPOSITE STRUCTURES, 22(4), 777-796, 2016. Han, Haipeng, Taheri, Farid, Pegg, Neil and Lu, You, “A Numerical Study on the Axial Crushing Response of Hybrid Pultruded and ±45° Braided Tubes” Composite Structures, Volume 80, Issue 2, Pages 253-264, ISSN 0263-8223, 2017. Huang, Jiancheng and Wang, Xinwei, “Numerical and Experimental Investigations on the Axial Crushing Response of Composite Tubes” Composite Structures, Volume 91, Issue2, Pages222-228, ISSN0263-8223, 2009. Chiu, L. N. Falzon, B. G. Ruan, D. Xu, S. Thomson, R. S. Chen, B. and Yan, W., “Crush Responses of Composite Cylinder under Quasi-static and Dynamic Loading” Composite Structures, 131, 90-98,‏ 2016. Deniz, M. E. Ozen, M. Ozdemir, O. Karakuzu, R. and Icten, B. M., “Environmental Effect on Fatigue Life of Glass–epoxy Composite Pipes Subjected to Impact Loading” Composites Part B: Engineering, 44(1), 304-312, 2013. Kim, J. S. Yoon, H. J. and Shin, K. B., “A Study on Crushing Behaviors of Composite Circular Tubes with Different Reinforcing Fibers” International Journal of Impact Engineering, 38(4), 198-207, 2011. Abdewi, E. F. Sulaiman, S. Hamouda, A. M. S. and Mahdi, E., “Effect of Geometry on the Crushing Behaviour of Laminated Corrugated Composite Tubes” Journal of materials processing technology, 172(3), 394-399, 2006.